Hello Jochen, thank you for being willing to appear on the Luftwaffe blog and for answering my questions. Could you please relate a little about yourself as writer and historian? How did you come to write the history of JG 53 ? Well, there are two different questions there! What can I say about myself as a writer and historian ? That's a difficult one. I’m not an educated historian, just someone very much interested in recent German history, in particular that of the Luftwaffe. I have commented on my motivation in several earlier posts on TOCH and LRG – suffice it here to say that a main drive of my occupation with the Luftwaffe fighter force is the fact that I’m truly grateful to live in a time in which so far no one has fired a shot at me other than my father’s generation which was deprived of their youth and had to go through the war instead. Therefore I feel obliged to try to create a forum where the names of those which fell victim to the war are preserved. And one thing I can say for certain as a writer is that I want to come as near to the actual facts as possible; at the same time I want to overcome long living legends and most of all the remnants of Propaganda and Nazi ideology which is still evident in several publications dealing with the Luftwaffe up to this day. As for JG 53 – well, I certainly did not wake up one day being struck by the idea that I should write the unit history of JG 53. In fact it was much rather a matter of coincidence. In 1985 I was asked to team with Gero von Langsdorff, Hans Ring and Winfried Bock to research and write the history of JG 3, this being a project of the verterans association of the Udet Geschwader. It ended in dismal failure as the association and in paticular its president proved to be totally incapable of any sort of reasonable co-operation and support and, what was even worse, aiming at censoring the manuscript to bring it in line with their perception of history. So, deeply frustrated we quit this project. While this was still going on and with nothing at hand to spend time on the JG 3 project, I continued my search for material for my collection. In mid 1986 I came into contact with Julius – Jule – Meimberg who invited me to his home asking me to show him what material I had on JGs 2 and 53. Back then it was still possible to stuff all of it in a laundry basket and so I drove to Münster. I returned with all of his albums and documents but had to leave my material with him as security. Two weeks later I swapped my binders for his material. On this occasion he sort of casually enquired why I shouldn’t write the unit history of JG 53 – he had an uncanny persuasiveness and on the background of my JG 3 frustration he quickly talked me into his project so that I accepted. Next time we met – around September 1986 - Jule had gathered four more JG 53 veterans, Helmut Bennemann, former Kommodore, Alfred Hammer, long time Staffelkapitän of 6./JG 53 and former Gruppenkommandeur of IV./JG 53, Wolfgang Dreifke, former Geschwader-Adjutant and finally Walter Rupp, flamboyant former Kapitän of 3rd Staffel. Together they signed a recommendation addressed at all former members of JG 53 to help me research and write the history of their Geschwader. This document over the next year opened the vaults of several hundred former pilots and ground-crew men of JG 53, leading to a steady flow of both documents and photos. The year 1988 was spent with writing the manuscript, the first part of which was published in 1989 if I remember it correctly. 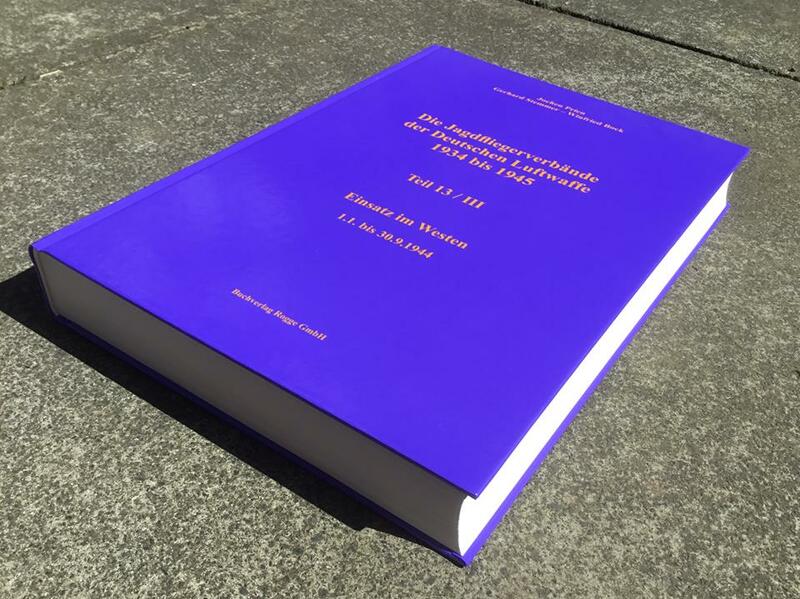 Unfortunately the printing and binding quality of Vol. 1 produced by Flugzeug Verlag was so bad that I decided to publish the remaining two volumes myself with the help of Struve Druck, generously assisted by a loan given by Jule and the other four sponsors – they gave it with the provision that only as much had to be refunded as the sales of the books allowed, the rest à fond perdu. It was paid back in total. What was your first published article/book? My first published article / book ? – that’s an easy one! 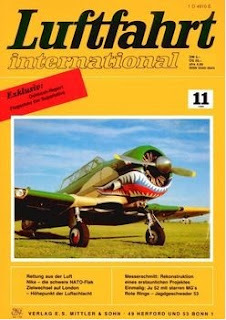 In Luftfahrt International Issue 11/ 1980 I published an article dealing with the red bands on the engine cowlings of JG 53’s Bf 109 Es during the BoB entitled "Rote Ringe - Jagdgeschwader 53". Looking back at it now it was sort of poking in the mist yet it alerted the late Michael Payne who became a very good friend for many years. How did your interest in the Luftwaffe develop - your father won the Ritterkreuz but was not an aviator I believe? My father was in fact responsible for my interest in Luftwaffe matters in general and in the Bf 109 in particular, not because of his own war-time experience as a tank officer but because he started to build scale models in the early fifties, lining them up on a nylon thread above my bed. So when I went to bed and when I woke up as a child there were always a string of aircraft models dangling from the ceiling above me. This of course triggered my interest to build models on my own – and the Bf 109 was the most appealing in my eyes ( and still is ). How do you recall writing and researching in the pre-internet pre-personal computer era? The jacket ‘blurb’ on the original German language edition of both the JG 53 and JG 77 histories if I remember correctly explained that the text was type-written and photo-statted to produce the finished work? It was totally different in many ways. Research was done by going personally to as many archives and museums as possible, in Germany and abroad, such as the Studiengruppe Luftwaffe, the Bundesarchiv and the BA/Bildarchiv, the BA at Kornelimünster, Sammlung Preussischer Kulturbesitz, IWM, ECPA to name just a few. Archives in the US could only be approached by writing letters. The most comprehensive means of information were micro-films with lots of original Luftwaffe documents stored but it was quite a cumbersome procedure to exploit the information. Most of the work was done by writing letters and using the telephone. It was all much slower than today and the waiting for a return letter was often enervating. There can be no doubt however that it was much more difficult then to create a comprehensive representation of for instance a unit history. One thing however was much better then – there were still many former pilots and ground-crew men around who were willing to help and still had a good memory. Yes, it is true that all three volumes of JG 53 and the first two of JG 77 were written with a simple NEC writing system with the text being stored on numerous floppy-discs. The text was printed and the photos inserted by Struve Druck. Just how much time is devoted to the writing and research of your JfV series? how is the work load shared with your collaborators? There are now some 18-20 volumes in this series..is the ‘end’ in sight or is it still ‘open-ended’? Don’t ask me how much time is devoted to writing and research – a lot! In our team I’m responsible for the text and the photos, whereas Gerhard checks the loss lists and Winfried contributes the information for the claims lists and re-checks the loss lists and the text. Of course we constantly discuss many issues underway. The end of the JFV series is in sight. After Vol. 13/IV, V and VI containing the statistical parts of the service over Germany and France in 1944 as well as Norway against the Western allies there will be most likely either one big or two medium volumes covering the Mediterrannean ToW in 1944. The final major chunk dealing with 1944 will be the East, most likely two or three volumes. That will leave us with 1945 – no idea yet how best to tackle this. Some of your work has been published in English, but most of it has not - why is this ? Would you not achieve a wider readership if you published in English for example? Well, I’m a native German dealing with a German topic so it is not entirely unusual that this is done in German. But yes, I would be very happy if at least the JFV series could be published in English but so far it has been impossible to find a publisher for such an undertaking, even less so as there is no guarantee that the series will actually ever be completed. Even the prospect of a substantial up-dating of the manuscript and an equally substantial addition of new photo material has so far not triggered any tangible interest. What do you think of the Osprey ‘Aces’ series - more to the point would you ever consider writing a book for Osprey, as some otherwise serious researchers have started to do. And people like Erik Mombeeck have launched their own book series such as ‘Luftwaffe Gallery’. Would you ever consider releasing your research/collection in this more ‘accessible’ type of format? Well, I'd certainly be prepared to offer my material gathered over the last 20 years for a revised English version of the JFV series but I’m not planning anything like Mombeek’s Luftwaffe Gallery. I have never seen a copy of the Osprey “ Aces “ series so I cannot comment on that. Yet I cannot imagine to write something about aces as this is a subject I do positively dislike for several reasons. That's an interesting comment. I suspect you dislike the fact that many of the aces achievements may be taken out of context and inflated in importance as they possibly were by wartime propaganda? In my opinion there is way too much emphasis being laid on the phenomenon of German fighter aces and their scores in Luftwaffe publications, often not far away from wartime propaganda; to me they were just a part of the overall picture and certainly not the most important one. From a distance of almost 80 years the number of claims filed should no longer be sufficient reason to focus on this small group of pilots: it seems more appropriate to acknowledge the fact that all pilots, the old hares like the young newcomers, had but one life to lose and that the unnamed pilots that perished in the war deserve the same space in the history of the German fighter arm as do the so-called aces. At the end of the day the number of claims a fighter pilot scored for me is not enough – at least even to this day - to elevate him above the rest. You also comment in your Gruppen histories from time to time on the German fighter aces 'naivety' and their naive 'world view' (cf. letter from Badum in JG 77 Teil II where he describes Russia as being 'dirty'). In your Intro to JG 27 you of course also recognise that the ace pilots were part of the Wehrmacht which made possible AH's policy of conquest ..among other things.. When I comment on the naivety of the German fighter pilots in Hitler’s war on several occasions this is in most cases not intended to be critical in the sense of an accusation; nobody who was not around then or in any comparable situation since and had to go through the same experience is entitled to criticize those young men for their perception of the countries and the population they were sent to. It’s just very striking in many cases to see just how much they were caught in the results of their (school-) education, intensively formed by the Nazi ideology, being led by a spirit of German superiority that left no space for scepticism or even criticism with respect to the part Germany played in the war. Another frequently encountered theme was the comparison between the social and economical situation in several – predominantly eastern and south-eastern – countries and the circumstances back home, almost inevitably leading to the conclusion that Germany was the superior nation. In not really few cases this comparison and the resulting high self-esteem led to the credo that Germany through the Wehrmacht was in fact called upon to bring order to the occupied countries. The tragedy was just how far the often – really or just imagined - good intentions were from the reality of the Nazis' war aims. A very wide field indeed and certainly too much to be addressed here comprehensively. I read a while ago that you were updating your Gruppe unit histories? That‘s just a side-line – it’s true that in the spare time between the completion of another volume and the start of the next I have started to re-write the histories of JGs 53 and 77 on the basis of the vast amount of new information which has become available over the last 20 or so years. Work on JG 53 has reached the end of 1940, that on JG 77 early October 1941. I cannot say whether these efforts will ever lead to complete new unit histories – it’s just very interesting and helpful to amalgamate the wealth of new information with the old manuscript. Jochen, I believe you are a partner in a law firm and work as a barrister. What are you planning for your retirement and will you have more or less time for research and writing ? Retirement is not yet an issue with three sons still to finish school or university; and honestly I have no concrete plans other than – if possible – to retire in 2021. My three sons, different as they are, are all interested in German history but not directly through my work and not in Luftwaffe matters in particular. They all made feeble attempts at modelling but this didn’t last long. But we can – and do – discuss historical issues for hours on end which is great fun and quite inspiring at times. Which of your many publications are you most proud of ? Could you describe the most rewarding aspects of the book production process? And some of the frustrations? I’m not particularly proud of any of the books I have published – for me it’s not a matter of pride. When I sometimes re-read some of the older volumes I arrive at thinking that it wasn’t really bad but given time and the necessary means most of it could have been done better. The most rewarding aspects certainly were the many postive, sometimes very personal reactions from former pilots and ground-crew men who felt that the the unit histories had done their service and their deprivations justice. This of course mainly applies to the unit histories of JG 1 / 11, 53 and 77 and – to a lesser extent – those of JGs 3 and 27. Work on the unit histories brought me in touch with a number of very interesting, sometimes outstandig personalties, the most prominent one being Julius Meimberg. 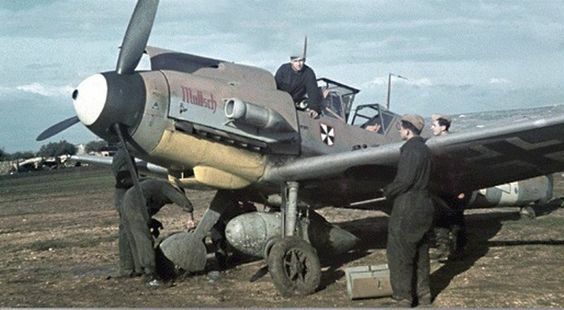 Just as rewarding was the fact that through my occupation with the Bf 109 and the Luftwaffe fighter units I made friends with many very decent fellow historians all over the world – if I started to name them here I fear that I might forget one and therefore refrain from it. But they are many and I’m glad to have made their acquaintance or even gained their friendship. Frustrations – yes, there are many but they don’t go deep and are not worth to go into detail here. As my good friend John Beaman once put it – swatting gnats. Thank you Jochen for responding to an approach from the Luftwaffe blog and on behalf of the air warfare enthusiast fraternity, thank you for your work! "...You're welcome. 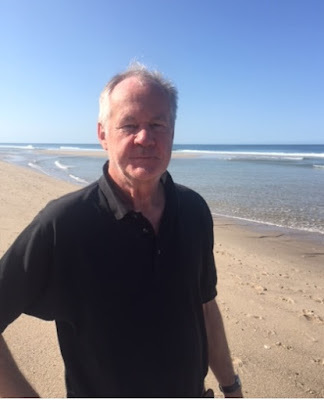 One last thing .. the photo of myself was taken today (03 September 2018) on the North Sea coast on the island of Sylt where my wife and I spent a most enjoyable short weekend. And no, I have no photos either of Gerhard or Winfried – as far as I know Gerhard and Winfried have never met personally, the three of us have most definitely never met up together. So no photos of the crew - I'm not sure that they would be a sales incentive anyway!..." Below; the latest volume in the huge ‘Luftwaffe fighter unit‘ series from Jochen Prien....Volume 13 part 3, nearly 700 A-4 pages covering Jan-Sept 1944, entitled "Operations in the West". Paypal accepted and orders are expertly packaged and processed rapidly! Also on this blog; more stories behind the Luftwaffe books!